Overview: Since the late 1930s/early 1940s, DC Comics (in all of its various forms and names) has kept three characters in continuous publication – Superman, Batman, and Wonder Woman. Now, telling stories about just one character for 75 years can be a challenge. Every comic can’t be a five-star masterpiece each and every month. There may be some issues, or stretches of issues, where the run of the character is a little rough. Think about how often Kryptonite turned up on Earth to stop Superman. And Batman had stretches where he was patrolling space to keep Earth safe. So it should come as no surprise that Wonder Woman encountered some rough stretches of storytelling. Guess what, DC is showcasing some of those issues in this second Wonder Woman collection. Robert Kanigher is a solid comic book writer. But I don’t know that he ever had a proper understanding of how Wonder Woman should be written. Pardon the pun, but Wonder Woman gets manhandled in the 20 issues collected in this volume. We get a lot of repetitive stories, like Wonder Woman having to choose between Mer-Man and Steve Trevor. (Seriously, one of those guys smells like a fish? Why is this even a decision for her?) The hardest stories to take involve Wonder Woman, Queen Hippolyta, Wonder Girl, and Wonder Tot (and yes, three of those women are one and the same) teaming up in some adventure that only their family can handle. Why should these stories be Showcased? : You know, I have to believe that the classic humorist Will Rogers would have nothing to say about these comics. I cannot recommend these, as much as I want to. Maybe if you are a Ross Andru fan, then, by all means, get this collection. But there are many other collections that showcase Andru’s work. Even trying to read these from the perspective of the early 1960s, they don’t work. The stories are sexist and misogynistic. I want my daughter to read Wonder Woman comics, but I don’t want her to read these issues. Unless you are a completist like myself, I wouldn’t recommend having this volume as part of your collections. Footnotes: Please see my review of Showcase Presents Teen Titans Vol. 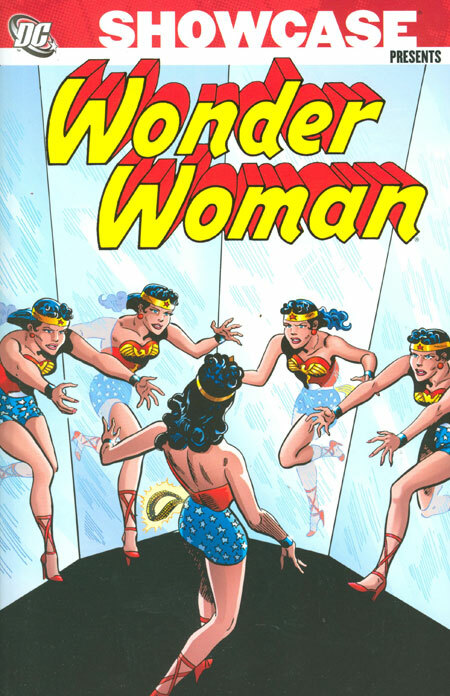 1, where I try to make sense of how Wonder Woman, Wonder Girl, and Wonder Tot can all appear in one story together. If you like this volume, try: the Wonder Woman run by Phil Jimenez from issue #164 (January 2001) to issue #188 (March 2003). This was a perfect match pairing the writer/artist with the Amazon princess. Jimenez draws incredibly detailed characters, in particular women, and the running joke in the industry is that he must be related to prior Wonder Woman writer/artist George Pérez. What makes these 25 issues (plus some Secret Files issues) stand out is Jimenez’ intelligent and complex stories. His initial story arc, Gods of Gotham, teamed up Wonder Woman (and her proteges) with Batman (and his family). While some of the stories have been collected in trade paperbacks, many of the stories can only be found in the original issues. This run is well worth the back-issue bin dive to find them. This entry was posted in DC Showcase Presents, Wonder Woman and tagged Mike Esposito, Robert Kanigher, Ross Andru, Wonder Woman. Bookmark the permalink. Pingback: Throwback Thursday – Showcase Presents Wonder Woman Vol. 2 – WORST. COMIC. PODCAST. EVER!